The opportunity to experience 40 miles of car-free streets in the most exciting and diverse city in the world is what keeps folks coming back to the TD Five Boro Bike Tour year after year. The 41st Annual TD Five Boro Bike Tour will take place on May 6, 2018. On that morning, 32,000 cyclists from every state in the nation and dozens of countries around the world will come together in lower Manhattan in support of Bike New York’s free bike education programs. From there, they will ride 40 miles through the five boroughs of New York City on car-free streets, including over the Queensboro and Verrazano-Narrows Bridges. Using proceeds from the Tour, Bike New York has, over the years, taught bike skills to more than 100,000 kids and adults throughout the five boroughs. The nonprofit’s bike education program is the largest of its kind in the country—last year alone, more than 25,000 kids and adults learned bike skills. 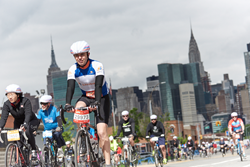 Media participation/coverage of the Tour itself is encouraged; interested journalists are invited to apply at http://www.bike.nyc/events/td-five-boro-bike- tour/media. Interviews and high-res photography available upon request.